Pop-punk with a science fiction and humorous bent, Madison’s DOCTOR NOISE plays hooky and fun rock songs that can swerve from psychedelic singalong (“Crazy Town”) one minute to straight up Doctor Who tribute (“Captain Jack Harkness”, “The Blue Box”) the next. 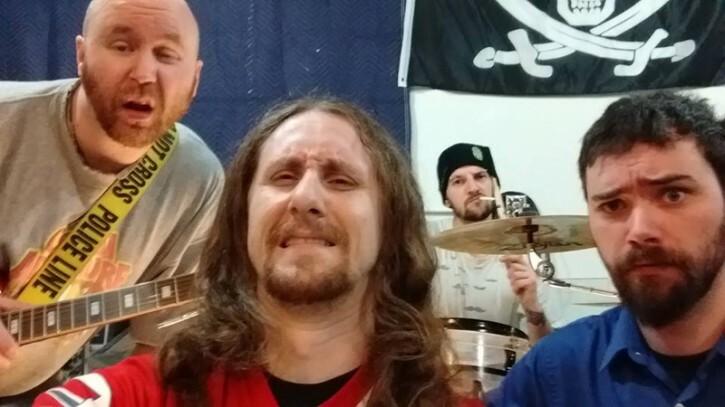 What started as a solo music project of YouTuber Bill Martin is now a full-fledged band with guitarist Tim Budzsiewski and drummer Jon Kussow (also in GOVERNMENT ZERO) and bassist Joe Golemb (also a horn player in 4 ASPIRIN MORNING.) We talked with Martin about the band’s upcoming performance at The Frequency on Friday, January 13th. MI: What got you into music? What was your inspiration? DN: I would have to say my father. I didn’t have any real interest in music for the longest time, though, despite my dad being at some points of his life a full time musician. But his artistic nature certainly influenced me when it came time when I decided I was interested in music and making music. Honestly, though, it wasn’t until I was basically in high school that I cared much about music, bands, styles, genres, anything. It’s odd to think about now, but true. MI: Who was your first favorite band? DN: THE BEATLES by far, and I was a big fan of the MONKEES (not realizing at the time they were a TV show band before an actual band). As time passed I eventually started getting into other things. MARILYN MANSON in my teen years was very influential. It’s basically why, these days, I worship the devil, sacrifice animals, and hate the human race or whatever weird crazy crap the people outside Manson concerts protesting claimed would happen when we all grew up. Eventually I got into the Punk, Pop Punk, Rock, Ska styles and have kinda latched onto them ever since. Though, these days some old fashioned Country is a great time, as well. MI: DOCTOR NOISE originally felt like the Bill Martin solo project and now it feels more like a band. Who were the bands that you guys gelled on as musicians together? What influences do you share? DN: From the start of having bandmates I wanted to make sure those who played the songs with me always played them to their style, not necessarily the style of the recordings which before them I did entirely by myself. So, the songs will sound slightly different live, often times better. With the latest CD, while I primarily did the writing and recording, their presence is now all over the CD. The drums are Jon’s creation, the bass parts are Joe’s, and the added guitars are all Tim’s. Along with that, Tim is a big help in finding harmonies I may have otherwise not even considered. We’ve even made some happy accidents in a few tracks that ended up becoming real parts. And I like that, I like sharing the project in this way because when it’s just me things run a huge risk of just being the same thing over and over and over. Lately we’ve even written a few songs as a complete unit as well. It’s been pretty cool! MI: What’s the difference you feel in working with these guys as to working solo? DN: Solo is fantastic. I went that road due to finding it very difficult to find musicians with either similar interests, similar ideas on where to take the music I/we wanted to make, or in many cases being unable to find anyone reliable at all. Solo is great cause when it came time to writing, playing, recording… if I showed up, the whole band showed up…on time…ready to go. In the music world, that can be hard to come by a lot of the time. MI: What’s the first song people should check out? DN: I guess that’s a toss-up between Sub-Reality or Hero Rising. I think either song reaches both ends of the spectrum of what I like to write and perform. DN: Probably BooFest. This year was the 2nd annual, but during both years the shows are pretty hard to erase from your memory. I decided in 2015 for our CD release to start a yearly show where instead of cheering the bands, we ferociously boo and heckle them. So far, it’s been a huge success. Honestly I can’t wait ’til next year for round 3 of everyone telling me to go…. you know… myself. MI: When’s the next DOCTOR NOISE album coming out? Enquiring minds want to know! DN: First off, learn how to spell inquiring Mike, jeez. Anyway, no plans on an album right now. Honestly, I/we never plan albums… we just wait ’til we have too many songs and then when it feels like an album can be created out of it… that’s the time to do it. Scheduling things rushes the process and I don’t think something like art needs a time table… so we actively try to avoid them. MI: What’s the show on the 13th going to be like? DN: A good time. We don’t take ourselves seriously on stage, but on top of that we take the performance VERY seriously. I think it’s easy to enjoy a band that seems to be enjoying themselves and we try to do that at every show. Whether things go perfect or fall apart, we will never not try our best and be ourselves. You can expect comedic songs, very serious songs, and just songs that are fun and will make your brain bounce.